After a record-breaking Memorial Day travel year, July 4th travel is expected to be just as busy. 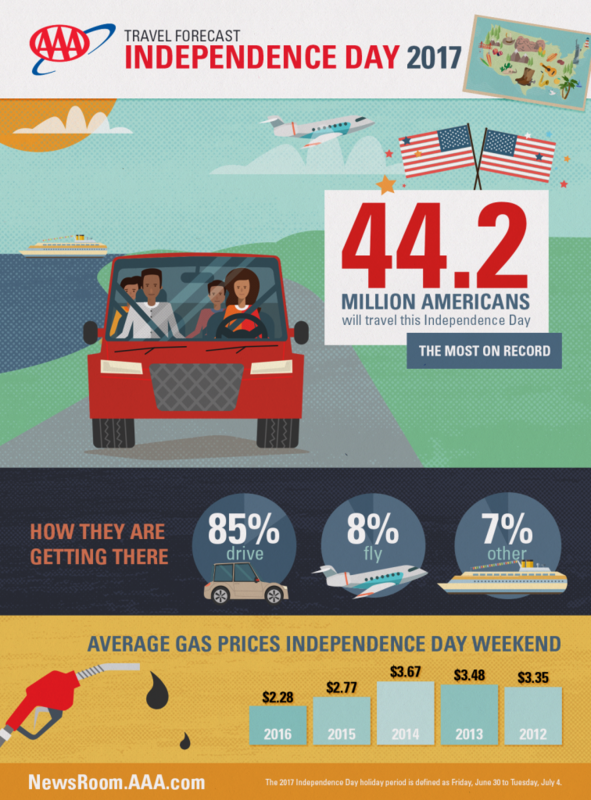 So, if you’re among the 44.2 million travelers expected to travel for Independence Day, you might want to consider some of these tips. Each year AAA teams with IHS Markit for an in-depth look at travel forecasts for major holidays, and this year’s July 4th travel outlook is historic. 2017 will have 1.25 million more travelers than last year (a 2.9 percent increase). If you’re flying, expect to be flying with 3.44 million people (an increase of 4.6 percent). And if you’re driving, expect to be joined by 37.5 million other drivers. Additionally, 3.27 million people will take other modes of transportation, like cruises, trains, and buses for the holiday weekend. And it’s good news for drivers: Gas prices are four cents cheaper than last year, with the national average price for a gallon at $2.28—a historic low for the summer travel season. Airfare and car rentals are also lower than last year, by about 10 percent, with the average round-trip ticket at $186, car rental at $65, and hotel nightly rates at $185 for an AAA Three Diamond-Rated hotel. Adobe also released its list of popular July 4th travel destinations, which include: Chicago, New York, Orlando, Las Vegas, and Los Angeles. If you’re traveling to one of the top July 4th travel destinations this year, make sure you plan ahead to avoid traffic and delays. The July 4th travel period is defined as Friday, June 30, to Tuesday, July 4, so travel on off-days to avoid the highest amount of traveler congestion. Check flights into alternate airports for fewer crowds to a major city. Buy a pass for expedited security if you’re flying an airline, like American, that offers this perk. Arrive extra early to account for longer security wait times due to longer lines. Buy access to an airport lounge in case of delays and crowds. Don’t try and plan activities close to or around your flight times. Leave extra time to travel to the airport in case of traffic. Better yet, utilize public transportation (like the train or subway) to get to/from the airport. Download time-saving traffic apps, like Waze. Make sure you have a roadside assistant service, like AAA. Leave early in the morning or late at night. Bring your car in for a full inspection or tune up before embarking on any road trip. Have a first-aid and emergency response kit handy. Pack plenty of water, phone chargers, and snacks for your ride. Good luck out there and Happy 4th of July!